“That’s why I’m running for Secretary of State,” said Raffensperger, who is from Johns Creek and now represents District 50 in the Georgia House of Representatives. Party Vice Chair Ed Perkins prohibited video or audio recording of the comments made by participants during the business meeting that followed Raffensperger’s presentation, though he did allow note taking. Most of the focus of those comments was on regaining Republican control of Oconee County’s two delegates to the Georgia House of Representatives, both held by Democrats following two special elections in November. Houston Gaines announced today (Wednesday) that he will run again as a Republican for House District 117 and that John Daniell, Oconee County Board of Commissioners chair, and Tom Odom, Oconee County Board of Education chair, are on the “Leadership Committee” for his campaign. Steve Strickland has announced his intent to run again as a Republican for House District 119. He also used his 10 minutes before the group to say he is for property tax reduction, using private businesses to provide government services, and campus carry. Raffensperger said he decided to get involved in politics “because I didn’t like the direction of the country. After last November, I like the direction of the country,” he said with a smile. “We really made a 180, and that’s a good thing, a good thing for America, a good thing for tax payers, a good thing for businesses,” he added. Raffensperger is an engineer who owns Tendon Systems, a special contracting and engineering design firm based in Suwanee in Gwinnett County. He is a native of Pennsylvania. Raffensperger told the group that the state’s voting machines were put into service in 2002 and that technology has changed dramatically since that time. Updating these machines “will be a big financial lift,” he said, and he wants to bring into the discussion the House of Representatives, the Senate and the Governor. “They are going to have to vote to fund that,” Raffensperger said. Raffensperger is one of five candidates with some interest in running for the Republican nomination for Secretary of State, according to Ballotpedia. The others are Alpharaetta Mayor David Belle Isle, State Rep. Buzz Brockway from Lawrenceville, Ken Brown, who owns a sales and business development company in Atlanta, and State Sen. Josh McKoon from Columbus. Qualifying for the primaries is March 5 to 9. Raffensperger took questions from the audience and was followed to the podium by Terry Milton of Walton County. Milton spoke on behalf of the Jim Beck campaign for State Insurance Commissioner. Tammy Gilland, chair of the Oconee County Republican Party, announced the no recording policy to me in an email message on Nov. 14. “I ask that in the future you only videotape our speakers/programs and not our business meetings,” she said. The local media do not cover local party meetings, and Sarah Bell and I have regularly video recorded Republican Party meetings in the past. I turned the camera off immediate, since the meeting took place in a private building under the control of the party, but Perkins asked me to make sure the camera was turned off before he went on the with meeting. 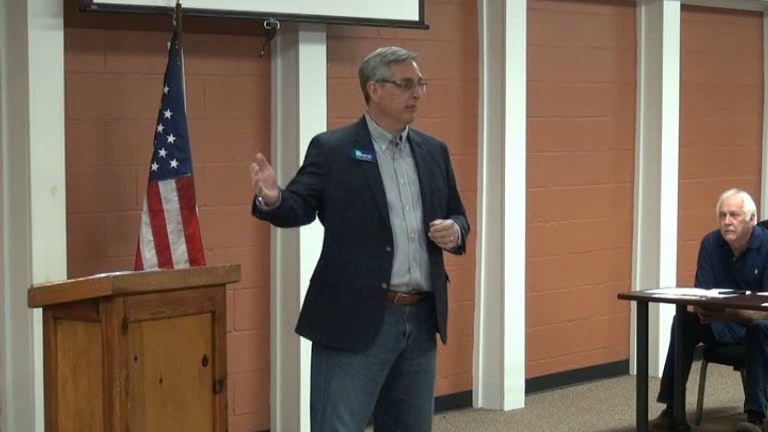 During what was labeled as the business meeting, Perkins told the group the party wants to make sure that Athens-Clarke County enforces its voting laws in the upcoming elections. House District 117 is dominated by Clarke County, and Democrat Deborah Gonzalez won that seat in November even though she lost the three precincts in Oconee County that are in the 117th as well as the small parts of Jackson and Barrow counties in the district. All of the remainder of Oconee County is in House District 119, which is evenly split between Oconee and Clarke counties. Jonathan Wallace won the 119th seat in November though he did not carry Oconee County. “We need to keep our eyes and ears on everything they do,” Marcus Wiedower, who was one of three Republican candidates defeated by Wallace in the November special election, said in response to Perkins’ comment on Clark County voting law enforcement. Gaines, the sole Republican in the special election for the 117th House seat in November, enters the 2018 election cycle with a large campaign cash reserve. Gaines had $96,863 in unspent campaign funds at the end of 2017, while Gonzalez reporting having only $11,466 in her campaign account. Gaines went out of his way to contrast himself with Gonzalez in his announcement today (Wednesday). “This district wants and deserves conservative leadership at the state Capitol--and that’s not what it’s getting now,” said Gaines in his statement. "I’m going to provide our district a conservative alternative to the out-of-touch representation we have today." Gaines emphasized his “Leadership Committee” in his announcement, which included Oconee County Republican Chair Gilland as well as BOC Chair Daniell and BOE Chair Odom. The inclusion of Daniell and Odom means that the two stand in public opposition to one of the two people the county has in the House of Representatives at present. Wallace and Gonzalez are closely aligned, and, were they to get re-elected in November, they would return to Atlanta with the knowledge that the leaders of the two governing bodies in the county worked publicly against one of them in the election. Commission Chairman Pat Graham from Barrow County also is on the announced Leadership Committee, but neither the mayor nor any of the commission members in Clarke County is on the team, and the only elected official from Jackson County is Sheriff Janis Mangum. Steve Strickland from North High Shoals announced in the Feb. 1 edition of the Enterprise that he intends to run again as a Republican for the 119th House District seat. He confirmed his intention to me in an email message this evening (Wednesday). The video below is of that portion of the Republican Party meeting I was allowed to record. Raffensperger began speaking at 3:42 in the meeting. Milton began his comments at 19:25 in the video. OCO: GOP 1 25 18 from Lee Becker on Vimeo. Ms. Gonalez has firmly made her stand to the left. Mr. Gaines is firmly to the right. The choice could hardly be more stark. I am pleased to see Mr. John Barrow run as a Democrat for Sec of State. The Democrats' Party is correct to support a reasonable moderate liberal for office rather than the usual leftists.